When stress is high productivity drops, retention of vital skilled staff is difficult, and the enjoyment of life can even be drained from home life. In this powerful full-day training your current stress level will be directly lowered and you will learn the advanced personal skills to control your stress levels, allowing you to be calm, effective, productive, and to enjoy your work/life balance! The key to this revolutionary approach to stress is in empowering each person attending. Rather than making one person responsible for putting stress management protocols in place this training gives each member of staff the ability to control their own stress; making you less stress reactive going forward. I am happy to discuss your individual needs before designing your training program. If required I and my staff can undertake a needs analysis for you. This training can be delivered to any size group. My team of therapists & coaches and myself are happy to work with groups from 6 people up. In large groups a max. of 12 participants per therapist is used ensure your success. A normal training of this sort takes 7 hours and can be delivered on-site or in clinic as required, and may form part of a full day or multiple day course as suits your needs. 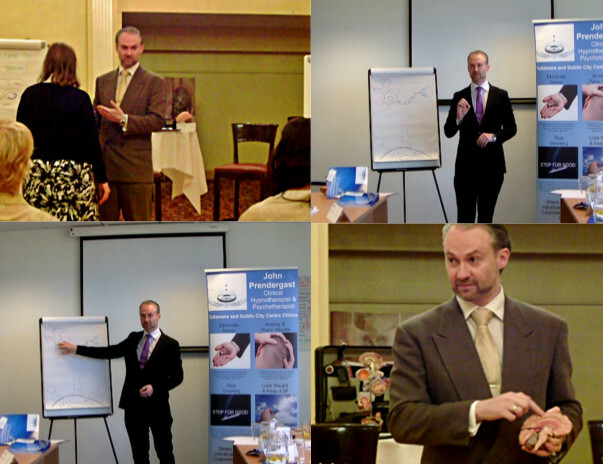 John Prendergast MCHPA, is a Clinical Hypno-Psychotherapist, Licensed Trainer of NLP & Business Performance Coach. He learned his hypnotic skills by training initially as a Hypno-Psychotherapist and Hypno-Analyst and then went on to refine his hypnotic skills even further with both Dr Richard Bandler in the USA and Paul McKenna in London. Thousands of real life inductions in the clinic allowed him to perfect his skills and to gain detailed insights into inductions and hypnotic responses across a huge cross section of the population, both in Ireland and abroad. If your Organisation, group or club would like to host a workshop please contact me and I’ll be happy to help.